Okay, I’ll get it out right up front; I dislike the word “cripple,” and these days, it would be all-but unacceptable to use it in publication, but this was written in 1976, by a woman who was (at that time) in her late sixties…so I’ll give it a pass. Thimo Bamstra is certain that he can repair the bones in her foot, to get rid of her limp and let her dance. Unsurprisingly, he falls for her, along the way, but has to get her past the crush she has over Leslie Chapman. Which, of course, he engineers to happen, although perhaps a bit…harshly, and she learns what Leslie really thinks about her! Esmeralda quickly realizes that she’s very fond of Thimo, but concerned that he’s got someone else on his heart; he does keep talking about “the girl he’s going to marry,” after all! The friends lived in a Victorian villa of great size and ugliness but with plenty of ground around it. The pool was at the back of the house and already the younger members of the family were in it or lying around in long chairs at its edge. See what I mean? Neels did that well, and that’s one of the things that make her stories enjoyable for me, even with their dated language and chaste plots. As is typical with Neels’ work, it’s not until the final pages that our heroine finally figures everything out that’s been going on around her all this time; we as readers saw this coming a long, long way off, so are unsurprised, and the “hook” here is not that it happens, but how. 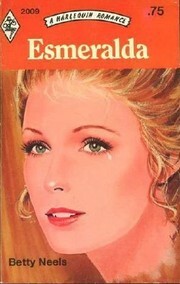 This was the era of short, short romances; this one is only 188 pages, but with Neels’ wonderfully economic, clever descriptions, she gives us a thoroughly believable, fun read that’ll warm your heart as you see Esmeralda overcome her disability, and clear up so much confusion in her life. Definitely another winner!